Book your Hertz summer rental early and save up to 20%! Whether it’s the grand tour of Germany or the wide open US roads, choose from our range of luxuriously large and spacious 7-9 seat people movers for the whole family, or a compact car to help you explore your destination with ease. 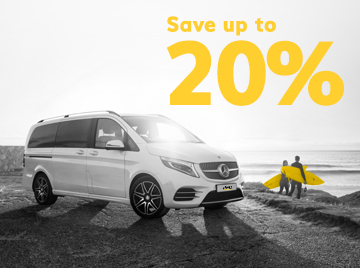 Book direct with Hertz anytime during April, save big and get set for a very special summer. Destinations: UK, France, Germany, Italy, Spain, Belgium, Luxembourg, Netherlands, Switzerland, Sweden, Czech Republic, Slovakia, USA, Canada, UAE, Kuwait, Qatar, Oman, Norway, Portugal, Australia and New Zealand. Available for rentals in UK, France, Germany, Italy, Spain, Belgium, Luxembourg, Netherlands, Switzerland, Sweden, Czech Republic, Slovakia, USA, Canada, UAE, Kuwait, Qatar, Oman, Norway, Portugal, Australia and New Zealand.